The Auburn University summer program for students with disabilities represents an innovative collaboration between the College of Education’s Department of Special Education, Rehabilitation, and Counseling and public elementary schools including Auburn City, and Lee and Chambers County Schools. The program began as an initiative to provide supports for children with behavior and learning disabilities. It has been held at both Yarbrough and Richland Road elementary schools. In addition to Hill, other major figures in the ongoing program include Dr. Margaret Flores, also of the Department of Special Education, Rehabilitation, and Counseling, and SERC doctoral student Regina Kearley. 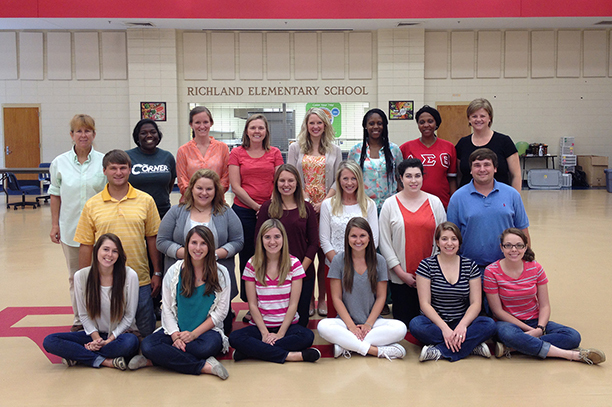 Dr. Doris Hill (back left) and doctoral student Regina Kearley (back right) with Auburn City School teachers and College of Education pre-service teachers at Richland Road Elementary.